Property owners and other interested parties who contract for construction work need to be vigilant and ensure that their property remains free from a mechanic's lien, especially those of any "hidden" lien claimants that may be working under another party and the owner is unaware. Therefore, an owner should draft, record, and post at a job site, a Notice of Completion, upon the jobs completion, because a lien must be perfected no later than 75 days after the project has ended or been abandoned. In Oregon, a construction project is deemed complete when (a) the improvement is substantially complete; (b) a completion notice is posted and recorded; or (c) the improvement is abandoned. O.R.S. 87.045(1). When all original contractors employed on the construction of the improvement have substantially performed their contracts, any original contractor, the owner or mortgagee, or an agent of any of them may post and record a completion notice. O.R.S. 87.045(2). 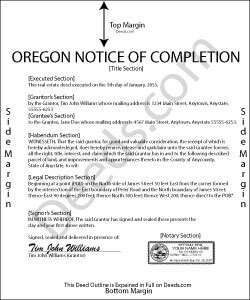 The completion notice must include a legal description of the property, the date the notice was sent, and the signer's name and address. Id. When completed, the Notice must be posted on the date it bears in some conspicuous place upon the land or upon the improvement situated thereon. O.R.S. 87.045(3). A copy of the Notice must also be recorded within five days from the date of its posting, by the party posting it (or his or her agent), in the recording office of the county in which the property, (or some part) is situated. Id. A copy of the notice, together with an affidavit made by the person posting the notice, stating the date, place and manner of posting the notice, must be attached to the Notice of Completion when it's recorded. Id. Anyone claiming a lien created on the premises described in a completion or abandonment notice for labor or services performed and materials or equipment used prior to the date of the notice must perfect the lien on the 75th day after work on the construction of the improvement ceases. O.R.S. 87.045(4). Proper use of a Notice of Completion will protect property owners by allowing them to know who might have a potential lien claim and start the clock ticking for the time to record such liens. This article is provided for informational purposes only and should not be relied upon as a substitute for the advice of an attorney. Please consult an Oregon attorney with any questions about the Notice of Completion or other issues related to liens.